LOLO – Kandi wants to talk.. Defense.. Defense..
LOLO – she’ll put her makeup on for 3 hours then we’ll talk to her..
R – I am. I am in very good spirits.. You gotta be.. You have a chance.. Tom was in a worse position than we are and he’s still here. Lo – The thing that hurts us now is numbers.. There’s so many of us and I feel like if it was just me fighting for my life I would be fine. I just don’t want to lose anyone. 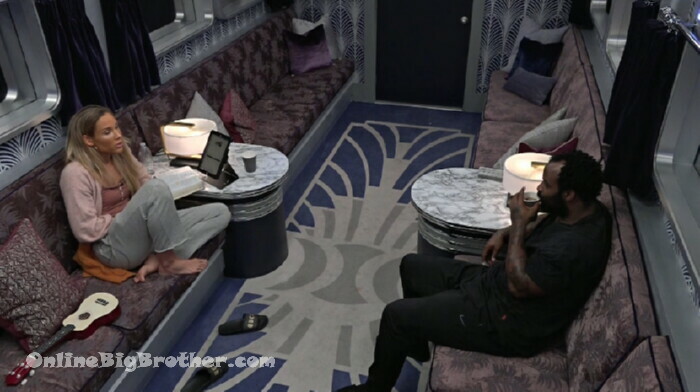 LOLO – we can be honest with each other if we’re all going to go the single route..
Ricky – I’m not going that mode until I actually see him nominate two of us.. Obviously that would be the smart thing to do.. LO – he’s a leo.. Play to his emotions.. Lo – I am just such a honest person IF I am going out I’m going out with my head held high.. Just the truth.. Lo – what transpired.. He really did hurt me that’s the truth.. I’m sure he thinks on our side there was some betrayal. WE definitely would have rolled with him to the end.. He blew up the alliance. Lo – it was so much clearer last night.. Lo – But if you do decide to honour what was broken.. You have a chance to stay here a long time maybe even to the end. Lo – your HOH you put her up on your own..
R – just don’t be accusatory.. LO – he went crazy with the interrogation.. He continues to think there was something between us (Ricky, Nat and LO) there was but there also was a strong alliance. It didn’t matter..
R – we had enough votes between us three to evict regardless of what the other ones did.. LO with more tidbits for Tom – you can’t beat us.. 2 of us will stay here.. Umm so you can’t evict everybody.. LO – you went from zero to the top.. The same thing can happen top to bottom..
R – you don’t have to add anything to what you’ve already said..
Ricky – we’ll do everything we can do to keep him safe final 4..
LOLO keeps going back to Alliance with Tom. Ricky tells her not to use that word. R – the truth is we have the most to offer..
R – exactly .. you got this.. just know you do this is the best chance to keep us here for you to have that conversation. Tom – I’m thinking about approaching LOLO telling her I want to use her as a pawn make everyone think she’s my target.. Put LOLO and Ricky on the block not backdooring Ricky.. we fight for the veto we don’t use the veto we vote out Ricky. Kandi – ok.. I don’t think you should put her up.. what if none of us win the veto. 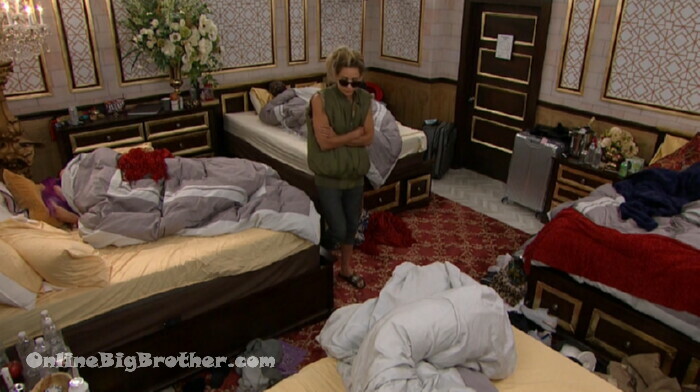 Tom – If Ricky wins the veto he’ll pull himself off and I put Natalie up..
Kandi – ok.. I dn’t know who Tamar will vote out..
Tom – well not me.. I need to be able to relax.. Ricky is always up in my face and Stuff.. one minute he’s super nice the next he’s not I can’t take it anymore I like the guy when he’s being nice..
Tom – lets say LOLO and Ricky are on the block and neither get veto..
Tom counts the vote.. thinks everyone other than Tamar will vote out Ricky. 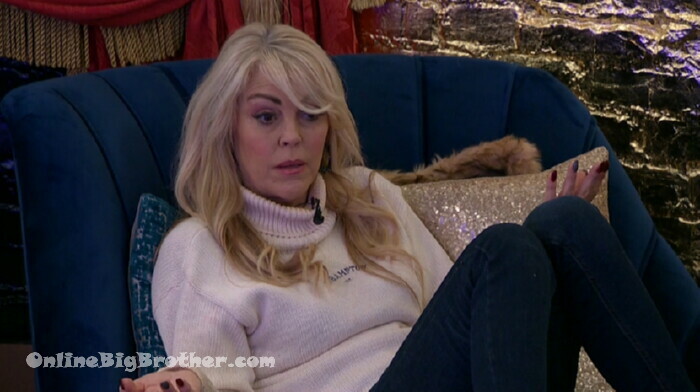 Tom – I am going to try and approach lolo and tell her she’s a pawn.. and tell her it’s a trick to make everyone including Natalie and Tamar I want to get rid of LOLO because she yelled at me..
Tom – I want them to think that so it’s easier to get Natalie out next week. 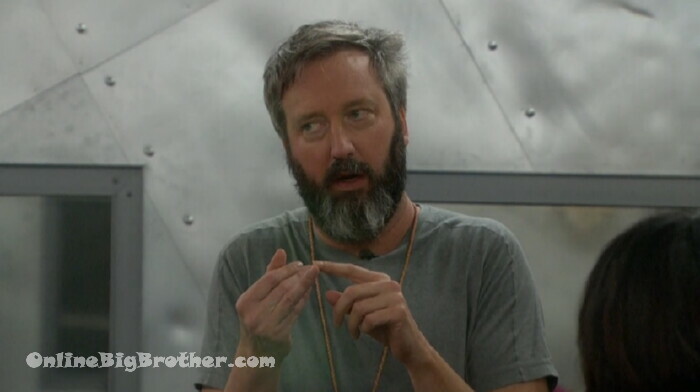 Tom – what do yo uthink of this.. LOLO and Ricky are on the block neither get veto.. you vote Ricky.. I vote Ricky.. Dina votes Ricky.. there’s no way Ricky can win ..
Tom – If Ricky and Natalie on the block..
Kandi – I always go for who is the better player.. Natalie knows the most.. she’s strong..
Tom – the fact, there is three of them I’ll put 2 of them on the block..
Tom – the main thing is I want LOLO to stay..
Kandi – I like LOLO..
Tom – me to .. we’ll talk about next steps later.. I don’t think Tamar really needs to know right now.. They are both agreeing one of Ricky, LOCO, Nat need to go. Tom is going to talk to everyone before the nominations. T – I have a proposal for you it’s not going to be easy to absorb.. It’s not going to sound like the best proposal at first..
LOLO goes on about being true to the alliance until it all blew up. T – you’re not the target.. There will be votes to vote off the other person and even if you are on the block we can use that to our advantage.. People would think we are not happy with each other anymore..
L – Do you know who the target is? T – It a bit of a fluctuating scale.. I’m pretty sure I do..
T – part of the deal .. the main part of the deal in exchange for him making sure she stays if she wins HOH she doesn’t put him up. LO – 24 hours later. . I understands the power came into play.. You accused me then you wanted to backdoor ricky.. You guys got close to Dina. Lo – I slept that whole day you guys used that against me.. Lo – it was very hurtful Tom.. .. You and Kato blamed me and Natalie for dismantling it all and that was not the case. Lo – for me you broke the team alliance..
Tom – I am being honest and truthful that you are not the target..
T – the reason you are not the target.. Although we’ve ad some tense moment I do feel that we get each other.. Lo says that last night her, Nat and Rick had the votes to evict Kato or Tom. Energy wise they wanted to keep Tom. Lo – why not have Kandi and Dina go up .. Lo – I feel like i’m getting hit with a double whammy.. You hurt me with the alliance and you put me on the block.. Lo – I didn’t break the alliance you know.. Lo – if you save me this week I will 100% save you next week.. I look forward to playing .. lets fix what’s broken.. Lo – you as HOH has the ability to set up till the end. T – I’ll be happy if I get to final 4 .. and if I happen to make it to final 2 that’s cool.. I’m not really thinking about the vote in the end. Lo – if you are thinking about final 4 we had a team.. Please go back to read the tweets.. I thought we had a team. Tom admits that he might have interrupted a few things wrong. Lo – I’ve come on here to play and work in a team.. I was loyal.. I’m still going to be loyal..
T – you’re on my side.. There’s only 1 person so what numbers am I up against? No numbers..
T – its me you Kandi and Dina.. potentially just one person.. It just flips..
T – the people now on yours and my side have never won a competition. Lo disagrees says she’s not going to win up against Kandi or Dina She’s gotten in too many arguments with people. Lo – America doesn’t vote .. I’ve made a lot of people upset.. You’ve seen the arguments i’ve had in this house. Tom – I don’t like talking about money but Dina and Kandi are pretty wealthy people..
T – you’re trying to get health insurance.. You’ve told me..
T – put that in your speech. You get a speech.. Lo – you’re not joking about that..
T – no.. I just want to get to the end.. Lo – I’ll fight like hell for the Veto..
T – I’ll make sure you get the votes you need if you don’t win the veto..
Dina asks what happened because loco is bawling. Tom – the agreement first of all we don’t talk about anything we talk about to anybody..
T – I have a plan ..
T – I would like to start by saying .. you’re probably going to win HOH soon .. netx week so if you win HOH next week I won’t put you on the block and you won’t put me on the block. Dina agrees says it’s her, Kandi and Tom they just need to find someone else to work with them. Dina warns that Natalie is the biggest threat right now. Dina – Ricky’s just floating.. he can’t be trusted at all..
Dina – since day 1 rude.. disrespectful not looking me in the eye.. my girls would never ever.. if there was a women in the house regardless of their thoughts..
Dina – Linsday is 32 she’s 34 she could be my daughter..
Dina going on that Tom should keep Ricky over Natalie..
T – we get Ricky out this week..
T – LOLO will work with us.. we will have final 4 you, Kandi, LOLO and Me.. no one will expect it..
D – lolo will you think? I dunno those two ..
T – she wants to win.. There was a conversation with Tom and Kandi right before the nominations where they talked about Natalie vs Lolo as a nomination. this conversation is what swayed Tom. LOLO says Tom is going to pick her as the replacement nomination. LOLO – he can’t play so he goes Dina.. all we’re asking is you vote with Ta, Me .. I don’t know what side Kandi is on.. Kandi is on Tom’s side.. LO – if you promise us the numbers are on our side becuase he can’t compete..
Hey Simon n Dawg you guys gonna do a more thorough job on BBCan7 this year? 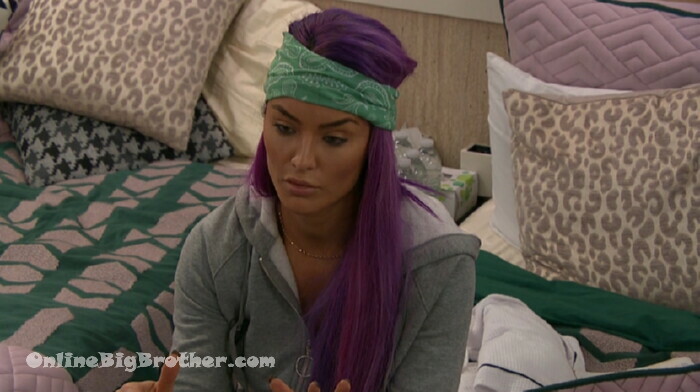 vanessa was an emotional wreck with good gameplay once you got past the fact that she frustratingly didn’t own her game or clue in the cameras. lolo is just cray. Hey bb90000. That’s a good question I’ve said earlier that we won’t do bbcan7 but now were talking like we will do limited coverage. the only season that will get 24 7 coverage will be the summer version. The rest of the shows will get something like what we do now. Ok, thank you for reply. Stay tuned :) thanks for the support bb9000 ! I can’t wait to see this play out. If Tom can use Kandi and Dina to get loco-lolo, nat, or tricky ricki out of the game, he may have a shot. Only problem is, Kandi and Dina will probably only be able to win a “Chance” competition for HOH since neither of them are very good at competitions. Only 3 episodes before finale. Tom Tom Tom what is wrong with you? LoLo is the biggest threat get over the Ricky issue. Get LoLo out first. yeah, breaking up nat and lolo should be plan a and b. ricky is plan c.
I was not particularly cheering for Tom, but every time Lolo talks (which is often), I start rooting more and more for Tom. I really hope Tom can pull this off and get one of the three out. Preferably Lolo. LMFAO @ Loco ! She wants him to “ honor” their former, broken alliance, like wtf? 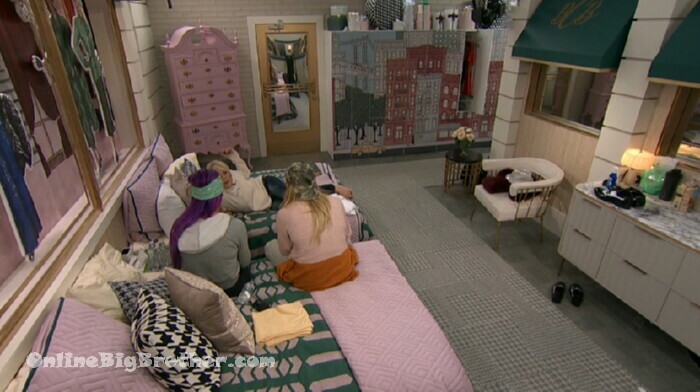 Please, please BB gods, I wanna see that trio gone, Loco first then Snakey/Nat…. then Cray-mar! After this eviction, I believe everyone plays in the veto. I could be wrong but if that’s the case, the veto becomes extremely important. Tom has done well in the comps so he may have some leverage going forward. Tom needs to stop obsessing over getting Ricky out. That’s what did him and Kato in before. The goal should be to break up the three (Loco, Nat, Ricky). He needs to talk less and just listen. That’s what the Hoh’s job is. See what kind of deals everybody is willing to make that benefit you and gather Intel you can use at a later time. I think making a deal with Lolo could be a good thing down the line. Not that he could ever trust her to uphold her end. But he might be able to use it against her. Her alliance might not be happy to know she’s making deals with Tom behind their back. I just hope he isn’t buying the crying and bs she’s giving him . If he doesn’t put two of the three up then he deserves to lose. Loco the hypocrite calls Tom a “ dirty greasy old man”…… man, can this woman (?) get anymore despicable? Wouldn’t mind Rickey ( puke) winning veto, Loco goes up…. then let her campaign against her “ homie” …..Craymar bitching about Kandi to Noco playing both sides when she’s doing the exact same thing? The way Loco, Natalie and Tamar talk about Tom is really despicable. He has not said anything unkind about them personally. The more I hear Loco speak, the more I realize why she’s still alone and a virgin at 36 yrs old. The three of them are mean girls. I never thought I’d say this, but Kandi is the level headed one actually thinking game and helping Tom pick the correct two to nominate. Kudos to her for showing she can play the game logically. She hasn’t stooped to the level that the other three “ladies” have. Where is Tamar with her “let’s be Christian” attitude now??? Oh right, that is only when she had control as HOH. Now Tom is a “dictator”….please. Go somewhere else with your fake a** “Christian” talk. I hate when people use the Christian card to suit their needs and act ugly when they don’t get their way. Tom is not smart at all. lets get this straight, LOCO blows up his alliance and they choose ricky over tom and kato. so instead of going after the head honcho WHO blew up his alliance he is going after a none target ricky? Tom…. I hope LOCO wins HOH next and evicts his DUMBASS. Ricky is a sleeper cell. He’s trying to stay under the radar but Tom knows he’s doing skullduggery behind the scenes. Ricky will make sure he wins the necessary comps at the end. That’s why Tom wants him gone now.